The North Penn School District, located 20 miles north of Philadelphia in Montgomery County, is currently home to 14,000 students. The district has plans in place to modernize its 17 schools. North Penn identified a need to upgrade several of its schools and to simplify the management of classroom technology. With only three individuals dedicated to technology and a restricted budget, the district set out to improve the teacher’s experience in the classroom and simplify the management of AV technology. Despite their limited budget, district officials were determined to procure the best quality products for the project. “When you have the right system in place, it makes life easier for everyone,” says Chris Doerr, Communications Systems Specialist at North Penn. North Penn sought an AV system that would be all encompassing and easy to manage. At the same time, the district required a solution that would be economical and reliable. Past experience had proven that seeking out the least expensive solution might save money in the short term, but the cost of an incomplete or poor performing solution added up tremendously over time. The PoleVault System is one thing that the teachers and support staff can rely on. In an effort to find the right classroom AV system, North Penn reached out to its most trusted AV suppliers and integrators for recommendations. After some collaboration, the consensus was that Extron provided the most cost effective solution in the industry. Extron Classroom AV Systems, including PoleVault, WallVault, and VoiceLift Microphone, were described as the most reliable systems available. In addition, Extron Global ;Configurator software provided an intuitive, step-by-step process for system setup with no specialized programming skills required. The combination of these factors supported North Penn’s goal of finding a solution they could manage themselves. The district made the decision to install the PoleVault System into several classrooms at its one high school. Taking full advantage of Extron’s online resources, Doerr’s team was able to build a customized PoleVault kit using the online Classroom AV System Configurator. As part of Extron’s secured Web site, the configurator enables users to create systems that meet their unique requirements and view the latest education pricing, giving them the tools to set realistic budget expectations. What’s even more commendable was the district’s decision to install the PoleVault Systems themselves. Traditionally a job contracted to integrators, the project was tackled by Doerr and his team, saving a substantial amount on labor and installation costs. Due to the comprehensive and integrated nature of the Extron Classroom System kits, the classrooms were completed in record time by three North Penn staff members. “The PoleVault kits included everything we needed,” says Doerr. “There was no waiting for parts or a call back from an integrator.” Although the PoleVault kits were purchased from an authorized Extron reseller, North Penn was confident it could use its own staff to install the systems. If anyone had a question during the installation process, North Penn could contact Extron directly on the S3 Support Hotline. 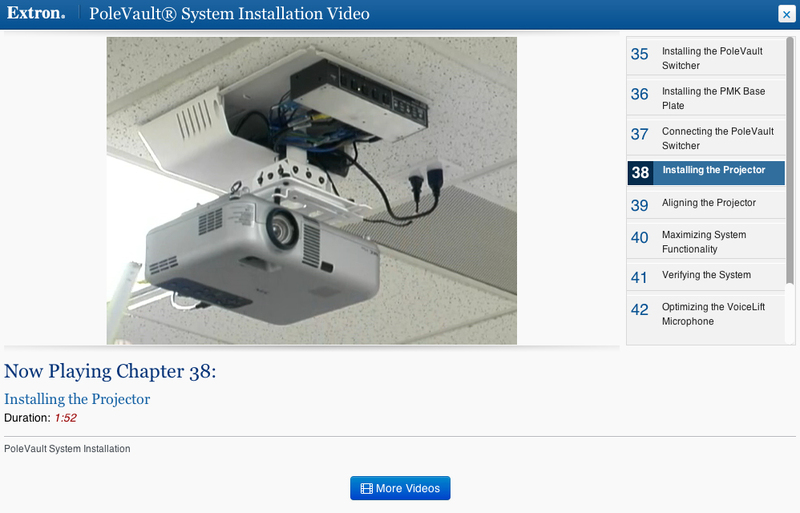 In addition to 24/7 on-call support, North Penn staff had access to a complete library of “How To” videos and guides ensure the equipment was installed correctly. “The installation was easy, and now we know exactly how things are connected and how they should work,” says Doerr. “The PoleVault System is one thing that the teachers and support staff can rely on.” Teachers have found the PoleVault System to be one of the most useful tools in the classroom, and support staff have the knowledge to be proactive with support and required maintenance. 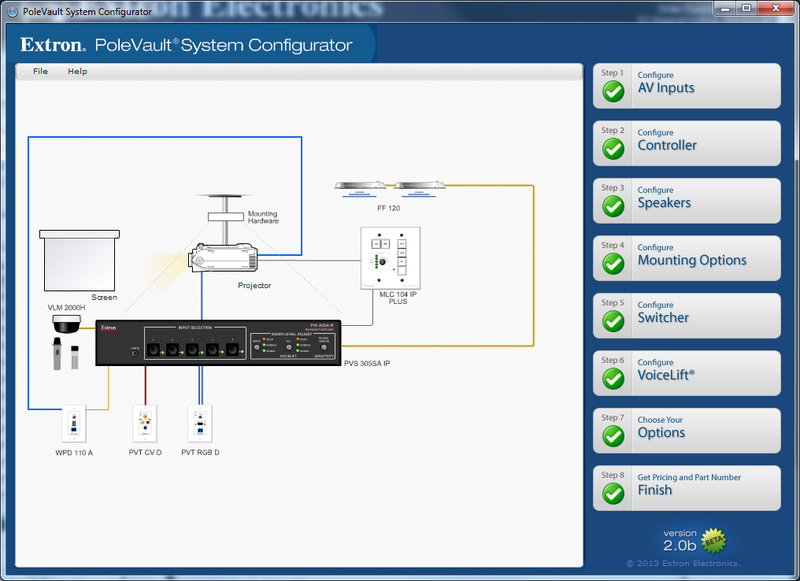 PoleVault is a complete classroom AV switching and control system.